Abhishek Bachchan, scion of Bollywood royalty, is a tall, handsome fellow with some hints of his father's screen-filling presence. While he has the looks for dark, brooding characters, he is at his ease and at his best in brash, goofy roles, embodying a certain kind of nerd cool. Indeed, so appealing is Abhishek in roles like Bluffmaster that one wonders why anyone bothers casting him in films like Umrao Jaan. Roy (Abhishek) is young, handsome, rich, and engaged to the girl he loves, Simi (Priyanka Chopra); he's on top of the world. He's also a world-class con man, though, and when one of his unfortunate marks turns up at the engagement party and cries foul, Simi tosses him out of her life. Devastated, Roy half-heartedly resolves to go straight, and full-heartedly to win Simi back. Before long, though, Roy runs into Dittu (Riteish Deshmukh), an aspiring con man himself, who convinces Roy to teach him the art. Dittu seeks revenge upon a shady hotelier named Chandru (Nana Patekar), who, Dittu explains, conned Dittu's father out of his life savings. Roy takes on the challenge. Then Roy's avuncular friend, Dr. Bhalerao (Boman Irani) - whom Roy had previously rescued from one of Dittu's schemes - delivers some life-changing news, and Roy is forced to look at the con game with a new perspective. Bluffmaster is charming and fun, thanks in equal parts to its star power and to tight, clever scripting. The most entertaining parts of a good con movie are the cons themselves, and here (as in Abhishek's comparable vehicle Bunty aur Babli) Roy and Dittu's gutsy schemes drive much of the fun. It makes no difference that the hustles would have little chance of success in real life - the frisson comes from being in on the game as the characters work their mojo on unsuspecting marks. And Abhishek and Riteish Deshmukh have ample appeal to pull it off, though in contrasting milieus; Abhishek is slick, handsome, and well-dressed, while Riteish brings a more everyman sensibility. Both are crisp and engaging. The supporting characters, too, are colorfully rendered. Boman Irani, as always, throroughly inhabits his character with quirkiness and humor. Nana Patekar is both menacing and comical as Chandru, the "big fish" whom Roy and Dittu set out to take down - he performs worship rituals before his own reflection. And the city of Bombay is itself a significant player in the film as well, portrayed with both grit and extraordinary beauty. 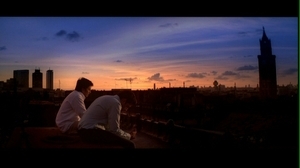 The film is full of rooftop and balcony shots set before sweeping cityscapes that are truly lovely. There are self-referential and expository themes in Bluffmaster that perhaps set out to comment broadly upon deception in real life, and particularly in films. (I have been told that in these aspects Bluffmaster borrows heavily from Hollywood's Matchstick Men and Argentina's Nueve Reinas, neither of which I have seen.) Bluffmaster never lets the viewer forget that it is a movie - from the title sequence in which a pimped-out Abhishek dances broadly on a stage set backdropped by a flashing marquee bearing the film's title, to the occasional framed still shots that introduced each of the movie's principal characters. There is undoubtedly metaphor lurking in all that self-conscious theatricality. But the truth is that Bluffmaster invited me to watch it with my brain off, and I did - I just enjoyed the ride, with all its abrupt swerves, and didn't look too hard for meaning or message. Bluffmaster, whatever else it may be doing, just spins a rippingly good yarn.